Emotional intelligence can mean the difference between behaving in a socially acceptable way and being considered to be way out of line. While most people will have heard of emotional intelligence, not many people really know how to spot it – in themselves or in others. Emotional intelligence is essentially the way you perceive, understand, express, and manage emotions. And it’s important because the more you understand these aspects of yourself, the better your mental health and social behaviour will be. It might be these are things you do without even really thinking – which can be the case for a lot of people. Or it might be that these are skills you know you need to work on. Either way, improved emotional intelligence can be very useful in all sorts of circumstances – be it in work, at home, in school, or even when you’re just socialising with your friends. So if you want to know if you’re emotionally intelligent, simply check the list below. Emotional intelligence can mean the difference between a good reaction and a bad reaction to circumstances. Emotions can contain important information that can be useful to personal and social functioning – but sometimes these emotions can also overwhelm us, and make us act in ways we would rather not. People who lack emotional intelligence are more likely to just react, without giving themselves the time to weigh up the pros and cons of a situation and really thinking things through. People who are less able to regulate their negative feelings are also more likely to have difficulty functioning socially – which can exacerbate depressive feelings. People with major depression have been shown to have difficulties understanding and managing their emotions. And research has also shown that more depressive symptoms are present in people with lower emotional intelligence – even if they are not clinically depressed. If you are able to recognise negative emotions in yourself and see difficult situations as a challenge – focusing on the positives and persevering – chances are that you’ve got high emotional intelligence. Imagine for a moment you lost your job. An emotionally intelligent person might perceive their emotions as cues to take action, both to deal with the challenges and to control their thoughts and feelings. But someone with poor emotional skills might ruminate on their job loss, come to think of themselves as hopelessly unemployable, and spiral into depression. Of course, there are times when your feelings can get the better of you, but if you are an emotionally intelligent person, it is likely that when this happens you have the skills needed to modify your emotions. For example, while average levels of anxiety can improve cognitive performance – probably by increasing focus and motivation – too much anxiety can block cognitive achievement. So knowing how to find the sweet spot, between too much and too little anxiety, can be a useful tool. It is clear that moderation is the key when it comes to managing our emotions. Emotionally intelligent people know this and have the skills to modify their emotions appropriately. And this is probably why emotional intelligence has been shown to be related to lower levels of anxiety. If you are able to extend these skills beyond your own personal functioning, then that’s another sign that you have high levels of emotional intelligence. Emotional intelligence can be particularly important in workplaces that require heavy “emotional labour” – where workers must manage their emotions according to organisational rules. This can include customer service jobs, where workers may need to sympathise with customers – despite the fact that customers may be yelling at them. This is why workplace emotional intelligence training is now common – with the most effective training focusing on management and expression of emotions, which are directly linked to communication and job performance. It’s also worth pointing out that emotional intelligence is a cognitive ability that can improve across your lifespan. 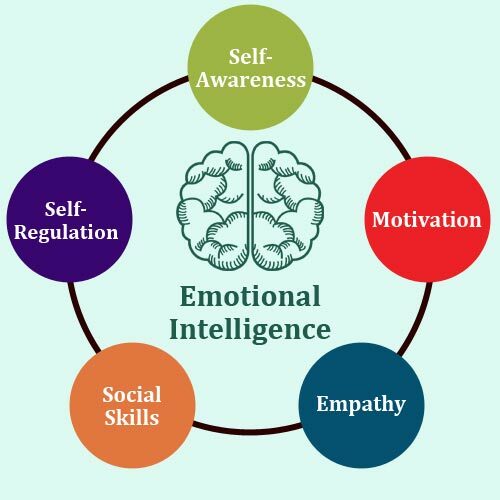 So if you haven’t recognized much of yourself in the traits listed above, fear not, there’s still time for you to work on your emotional intelligence.